Wednesday night: Mainly cloudy. Shower toward morning south. Low 60s. Thursday: Developing sun. Brief pop-up shower in the afternoon. Mid and upper 70s. Although our New England air is pleasant Wednesday, there’s a cold front approaching from the north and a disturbance moving east out of the Great Lakes that will close in on our region by the night. The Crown of Maine is the first to see impacts from the approaching cold front with showers from midday onward Wednesday. 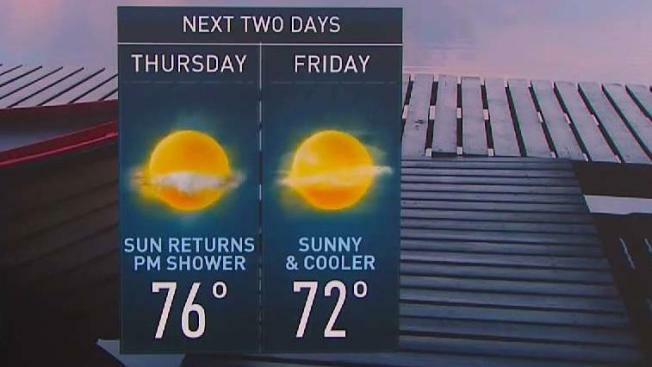 Elsewhere in New England, sunshine fades behind increasing high-altitude clouds with high temperatures around 80, then a few evening sprinkles are possible in Connecticut. Showers will also develop along and near the South Coast around and after midnight. Thursday should dawn with showers ongoing near the South Coast – particularly the Cape and Islands – but the passage of the cold front will carry those showers offshore by mid-morning. The rest of Thursday will feature just enough moisture in the atmosphere to bubble up fair weather clouds that could produce a sprinkle, and an onshore wind that will coordinate with the new, cooler Canadian air to hold most high temperatures in the 70s. The cooler, drier air will remain in place Friday, holding deeper moisture at bay until Saturday, when a strengthening storm moving east from the Midwestern United States will thrust that moisture into New England, resulting in developing showers and cool air Saturday, particularly from midday onward. By Sunday, the approaching storm center will drag warmth and humidity into New England, bumping temperatures into the 80s with scattered showers and thunderstorms before another shot of cooler air early next week precedes a return to nearly 90 degree weather toward the end of the exclusive Early Warning Weather 10-day forecast.